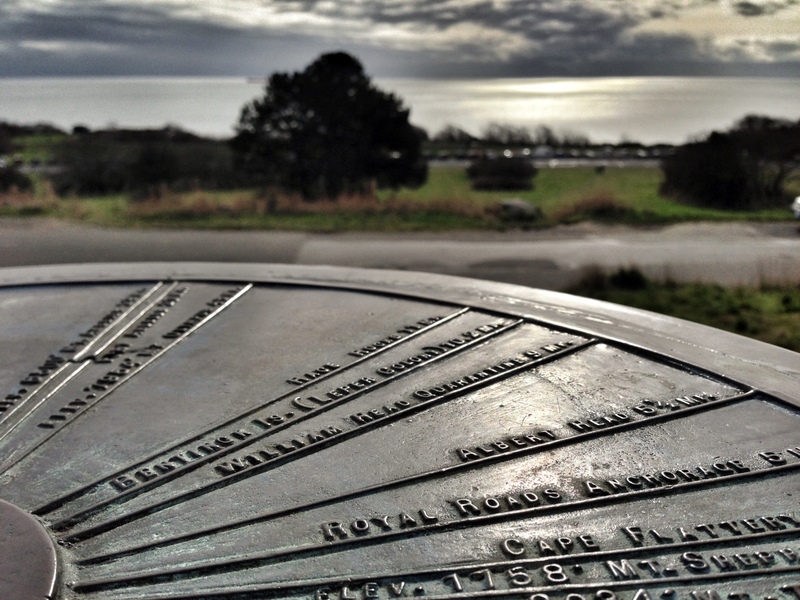 The plaque on Beacon Hill Park’s Mountain Indicator as it stands today. So wrote the Dominion Medical Monthly: Ontario Medical Journal, in December, 1898. At Victoria’s historic Beacon Hill Park’s south end stands a short concrete pillar, seemingly uninteresting from a distance. Intrigue, however, arises upon reading its weathered brass plaque. With an assist by Google Map, the colony’s location. 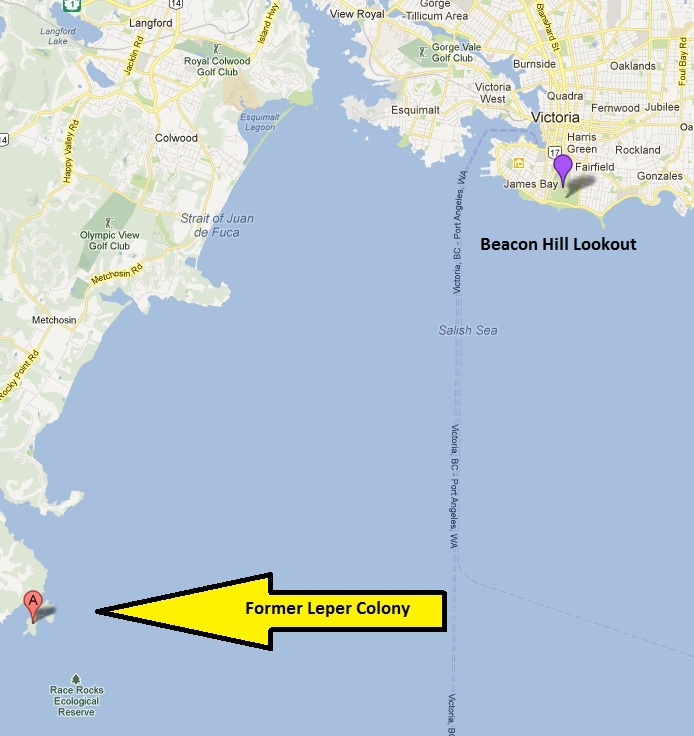 As “historical records” go, I was struck by a line that reads “Bentinck Island (Leper Colony) 10.2 mi”. Today, Bentinck Island is where the military tests weapons. But in that past spoken of by the Mission, before Bentinck Island’s incarnation as a national defense site, it housed a leper colony. Located off Metchosin by Race Rocks, it had residents from 1924 until 1956, and closed shortly after. Bentinck Island is only part of the story. Conditions were reportedly humane and to be expected of a quarantine. That was the end of the leprosy era in BC. There was a beginning, a disturbing and inhumane beginning. For the first half of this era, from 1891 until 1924, the lazaretto, aka leper colony, was first located off Sidney Island, on a small island called D’Arcy*. While Canada had a leper colony in the Maritimes at this time, the residents there were Caucasians. 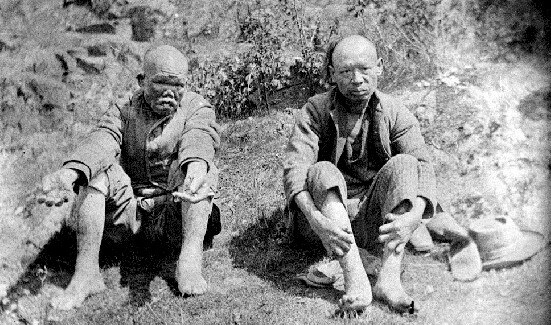 These lepers, sadly, were Chinese immigrants. Understating it drastically, let’s just say relations between races were poor in 1890, strained for a whole lot of reasons, not the least of which being the loss of work for whites due to the cheap but diligent Chinese workforce invading the province. With Chinese-Canadians already considered second-class in those darker days of race relations, the the Head Tax days, it’s not a stretch to see how those in power would consider these five disease-carrying immigrants as barely human and hardly a civic obligation. 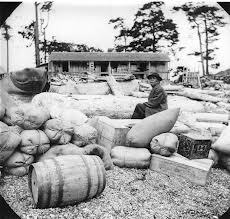 From the archives of the Royal BC Museum, D’Arcy Leper Colony as it stood in the 1890s. But let’s back up. How’d they get there? 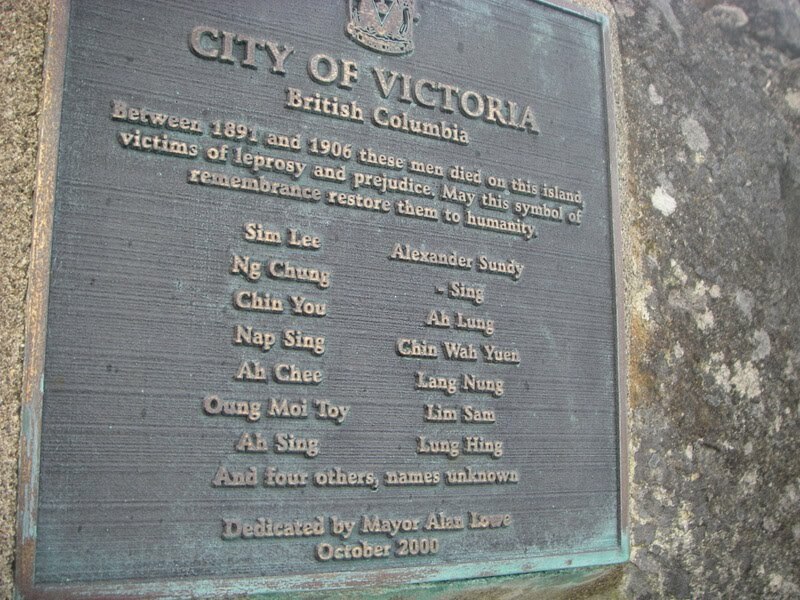 Victoria was the landing port for most Asians looking to enter Canada. Every now and then someone would elude health inspectors. In early 1891, city officials became aware of five immigrant Chinese lepers being hidden away in Chinatown. They were quarantined immediately, and on April 22nd, provincial permission was received to begin quarantine on the selected site of D’Arcy Island. …Because of fears that the disease would spread to the “white population,” officials in Victoria insisted that something be done to isolate the lepers. In May 1891, the unfortunate five were forcibly removed from Victoria and taken by steamer to D’Arcy Island, 25 km away. D’Arcy Island, part of the San Juan archipelago, is separated from Victoria by the Strait of Georgia. Its 180 hectares had been designated for “sanitary purposes” by the provincial government, which had prepared a longhouse containing six separate rooms; food and provisions for the lepers were provided by city council and Chinese merchants. Every 3 months, a harbour steamer brought Victoria’s municipal health officer and sanitary officer to anchor in a sheltered bay where the leper colony had been established. A landing boat would leave food and clothing on the beach. The medical officer gave the lepers a cursory look along with free opium – while an armed crew member stood guard in case anyone tried to escape by boat. Of course, if escape attempts did happen, they were to no avail, it seems. A plaque commemorating the lives of those who died here. Photo by “Paddlesheep,” a blog linked to in this story. For a D’Arcy leper, quarantine was essentially a life sentence. Five started out there, more would join them in coming years, but they’d be few, with a some reports stating a total of 49 lepers passed through D’Arcy and Bentinck by its end. 13 men died during the D’Arcy Island years, but some also were repatriated to China in 1907. Obviously, between the disease, the isolation, and the four-times-a-year supplies run, the lepers’ longevity was not a priority for the government. All indications are that it was the lepers’ Chinese ancestry that allowed the quarantine to be run so minimally, dare I say inhumanely, for so long. These days, one landing on D’Arcy Island is likely to be a kayaker enjoying its remote beauty. As a part of the Gulf Islands National Park Reserve, it remains as remote and isolated today as it was in the time of the quarantine, making it a kayaker’s haven, as this blogpost conveys. But 122 years ago, that haven must have been desperately lonely, isolating, and even terrifying for those immigrant lepers just shuttled off and left to quietly live a life of struggle, or quietly die as they please. In 2000, the leper colony era of D’Arcy Island ceased being a dirty little secret in Victoria’s past when the Mayor and Council erected this commemorative plaque on D’Arcy. Since then, few remaining concrete ruins of this dark passage of Victorian history have been photographed and used in an Alberta art installation. I find the legacy of D’Arcy and Bentinck are yet more reminders that this quaint, pretty town of Victoria was born of colonial ambitions. The lepers of D’Arcy Island were hardly the first victims of those ambitions. Just ask the Songhees natives. Two of the early “residents” of D’Arcy Island. Photo credit unknown, from Wikipedia. I find these historical accounts sad, even heart-breaking. I understand the desire to pretend it never happened, that we’re a kinder, gentler world now, but I know better. I grew up in the era of AIDS and I remember the height of the epidemic and science being at a loss to treat it, with many voices calling loudly to “put them on an island and let them fend for themselves.” Quarantine the healthy and screw the infected. If the right disease comes along, I believe those same rallying cries will be heard again one day. It’s why I think it’s important to remember these darker histories. Since moving to Victoria, I’ve become increasingly fascinated with civic history. I look forward to learning more, particularly about early Chinese history in Victoria and the Songhees nation. There’s something very intriguing about both these cultures juxtaposed against a proper Victorian British culture. I’ll continue sharing these histories as I learn of them. From the Montreal Gazette in June, 1974. *There are two D’arcy Islands side by side. A small and a large. I’m speaking of the large. **I highly recommend a reading of this GVPL site essay on D’Arcy Island.